Happy Birthday, Grady, I miss you! Hey, all ewe wiener lovers! Okay, first ting ewe might notice is I’m typin’ like I normally tweet! Whut does dis meen for all my loyal readers? Well, it meens my spellin’ an grammar ain’t too good. Mom an I had a weally long diskussion about it and although she tinks dat I shud spell my stuff right, I told her, “Mom, look…my fans like da way I talk, so ewe jest need to get ofer urself and let me type like I want!” She jest shook her hed at me and sighed. She does dat a lot! 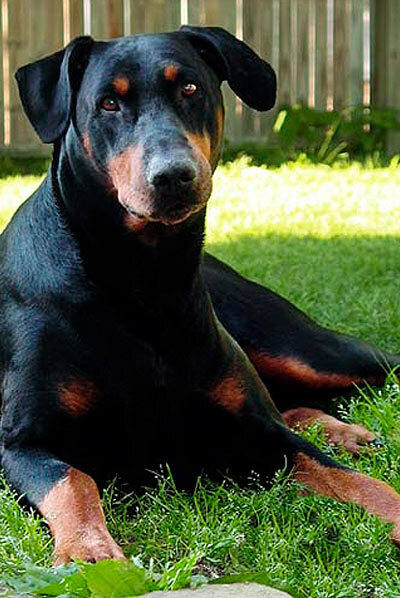 Grady was a weally big Doberman Pinscher who weighed, like, I dunno, maybe like a thousand pounds! Well, maybe not dat much, but he was weally big, like 138! Wen I met Grady, I was a wittle whippersnapper an only wayed like, not even a pound! I went up to him, sniffed him weally good, and ewe no whut he did?! He was skeered! Seeriously, the big galoob was skeered to death of me! Don’t belief me? Look at dis pikchur! Grady cryin’ for his Momma! So, wight afer dat happened, I sed, “Look, big guy, I promise I’m not gonna hurt ewe. 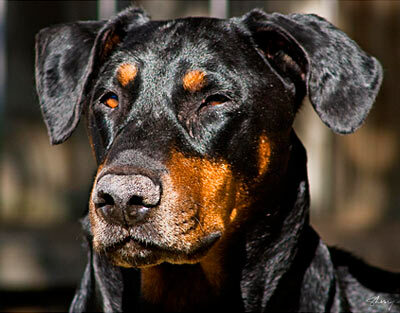 I jest wanna get one ting straight, okay?” He looked at me wid dos big brown eyes, an sed, “Let me guess…ur in charge?” I toll him, “Wow, ur weally smart for a Doberman!” He jest sighed weally big, too. I dunno how come everyone sighs around me so much! 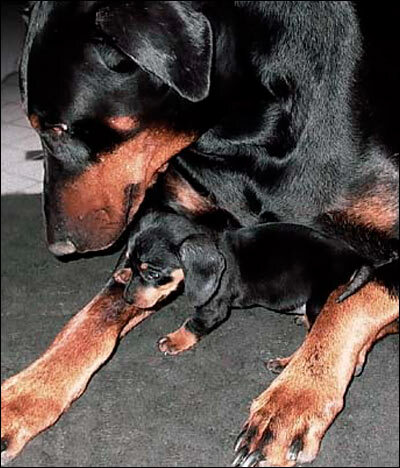 Later, he toll me dat his older broder, Tyler, used to be in charge, so he was used to it. Grady never was one to care who was in charge, jest so long as someone was in charge of fillin’ da food bowl! My big broder, Grady, was a weally awesome dog. 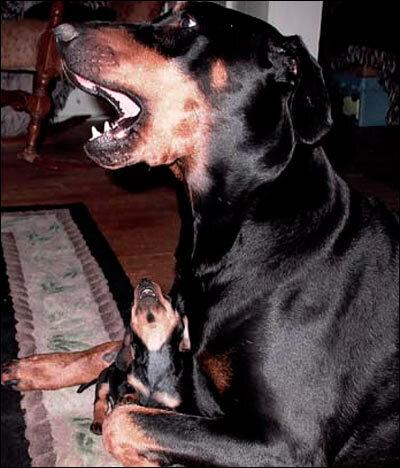 When I was wittle bitty, he wud let me take da toys away frum him, even tho I nos he cud prolly eat me wid one bite! He never, ever, ever even growled at me, even tho I was sumtimes meen to him. I wud snap and snarl, an even twied to hump his leg a few times! I dunno if dogs roll der eyes, but I figger Grady prolly rolled his a time or two wid me when I was a silly little wiener puppy! Da thing dat I loved about Grady more dan anything in da world is dat he wud let me sleep on him! I wud crawl up on him, snuggle in, and he never made me move ever! Once, he was weally tired and rolled over on me. I guess he thought dat since I always slept on him, he cud on me, too. Well, while it mite haf been a photo op for mom, it did kinda squish me! Jest look…I’m a wittle freaked out! Aktually, I was okay until he snored. Geez louise! Talk about rattle da rafters! 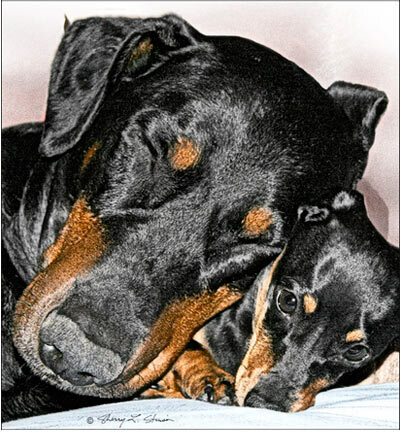 Mom took tons of pikchurs, den made dis one into a pet greeting card for TylerDog Cards. I tink it’s my favorite card of all time ’cause it has my bubby an me on it. After havin’ him in my life for five whole yeers, my sweet broder, Grady, died last year at da age of 9 yeers old. Der isn’t a day dat goes by dat I don’t tink of him. I miss how he used to let me sit between his paws an chew on him. An I miss how he wud always go outside wid me to make sure nothin’ ever got me. I miss how he wud come running if I ever barked, jest to make sure everything was all wight. An I weally miss how we used to sing wen da fire trucks went by…boy, were we ever a doo-et! I guess, wen it’s all sed an done, I jest miss my big brother.